Ben loved his race car cake! 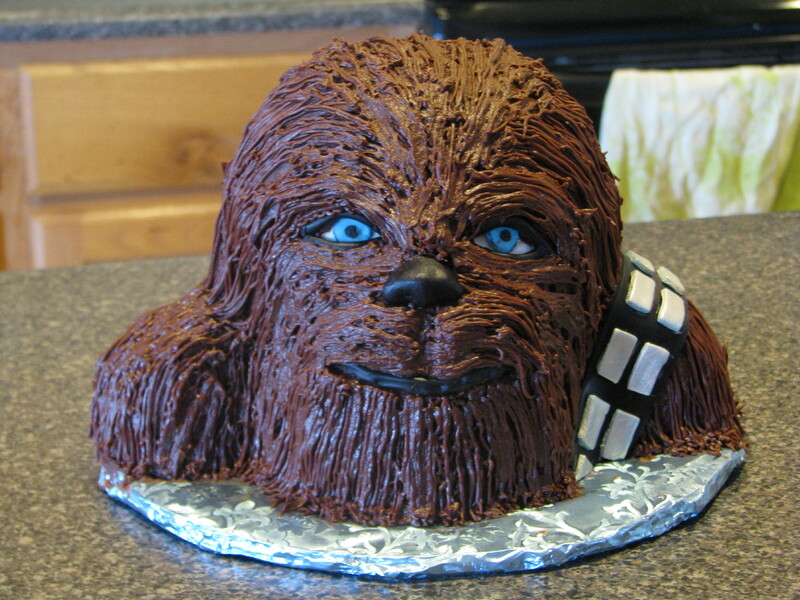 It was made in celebration of his second birthday and was “chockate”. I held up two boxes of cake mix at the store, one vanilla and one chocolate, “DAT ONE” was the imediate answer. He now asks for “chockate” on a daily basis. We’ve created a monster! Now to the confession, this really is the first fun cake I’ve done for my own children! Sad! Especially considering the fact that one of the reasons I learned how to do this stuff was to make fun cakes for my own kids. However, in the past cleaning the house, preparing for guests, making food and coming up with games and etc… came first. 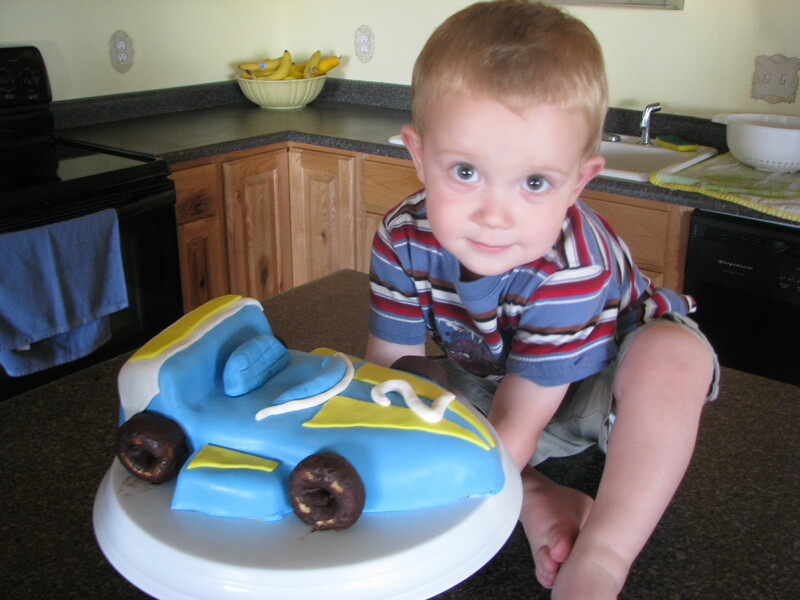 The thrill that Ben had with his race car was enough however to convience me that creative cakes are a must for the future, we will just scaled down other areas. This particular cake design is one from 50 Easy Party Cakes by Debbie Brown. Hands down it is by far my favorite kids cake book, the designs are great, not overly complicated and fit a number of themes. If you have any interest in making cake in fondant for any children in your life you’ve got to get this book. I did use chocolate donuts for the wheels, instead of the big honking gob of black fondant that the design suggested. She does love her fondant, after all she’s brittish. 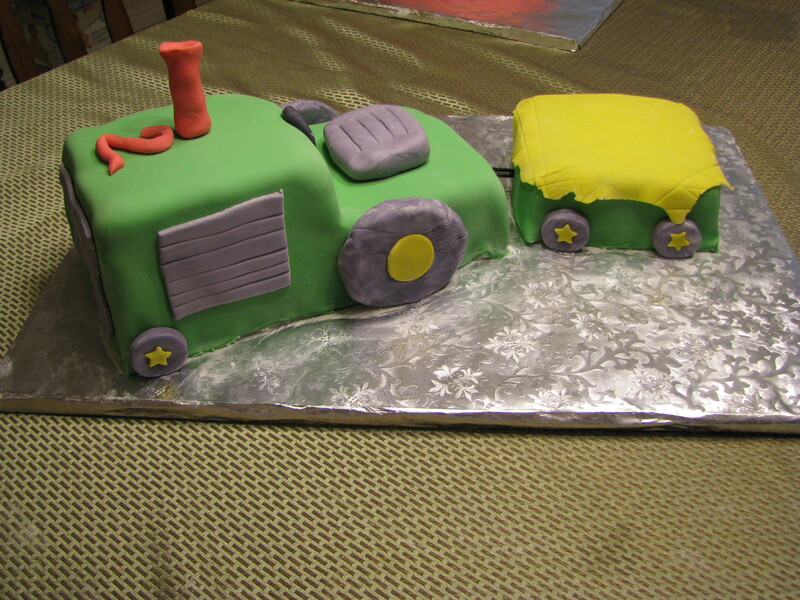 This Tractor cake was for a two year old boy’s birthday, I would have liked to see his face when he saw his green tractor (it had to be green). It was all chocolate- cake and filling with vanilla butter cream and then covered in fondant.